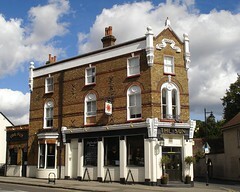 Pub in Carshalton, in the Good Beer Guide. It's on the upmarket side, but unusually for a gastropub has a good selection of real ale, with five handpumps on the bar offering interesting choices. A large sofa sits behind a low coffee table near the entrance, with a few tables and chairs off to the right. The bar is on the left, with a narrow space in front of it that leads through to more seating at the back. A side corridor lined with old pump clips gives access to the garden. The garden is quite impressive. The top section, on a level with the pub, consists of part-covered decking including a hideaway space with a long table surrounded by banquette-style benches piled with colourful cushions photo. Lower down is more seating, with shelter here provided by huge parasols photo; this part of the garden is also home to a children's sandpit and a guinea pig hutch. Kake visited on a Tuesday lunchtime in September 2012. There were five real ales on: Goddards Ducks Folly, Sharp's Doom Bar, Brains SA Gold, Orkney Red MacGregor (£3.50/pint), and Gravesend Shrimper. They also had various keg taps including Addlestone's Cloudy. There were a fair few people in when I arrived around 1:30pm, but there were a couple of free tables inside and plenty more outside. Music was playing, even seemingly piped out to the decking area of the garden, though this had ceased by the time I left. As of September 2012, food is served 6pm-9pm Mon; noon-3pm and 6pm-9:30pm Tue-Fri; and noon-4pm and 6pm-9:30pm Sat-Sun, from a menu divided into small plates, sandwiches/salads, and pub classics photo of menu, photo of dessert menu. The menu includes several vegetarian options but few if any vegan. I went for two of the small plates, which turned out to be plenty for a satisfying lunch. Cornish yarg and spring onion croquettes (£5) photo were served with salad and coleslaw. The croquettes were very creamy and cheesy inside, yet structurally sound and crunchy on the outside. The texture reminded me a little of Spanish-style croquettes, though these were based on mashed potato rather than bechamel sauce. The accompanying salad was also good; crunchy, fresh, and flavourful. The coleslaw was clearly home-made, with a high proportion of veg in relation to mayonnaise, and prettily presented with the strands of the vegetables folded over into a little bundle. Chorizo and borlotti beans with bread (£5) photo came as quite a substantial portion, heavy on the chorizo (I would actually have preferred more beans and less sausage). It was relatively spicy for pub food (and there was no warning of this on the menu), but it worked nicely and was still well within my chilli tolerance. There was quite a lot of chopped onion in the dish; I would have preferred either less onion, or for it to be cooked a bit more, since it retained some bite and hadn't got to the point where it would have softened down and acted as a thickener for the sauce. According to a note on the menu as of September 2012 photo, poker night is Monday from 8pm, quiz night is Tuesday from 8pm, and live acoustic music is on the first Sunday of the month from 6pm. Kake's verdict: I'd come back for both drinks and food. Child-friendliness: According to their website as of September 2012, children are welcome until 7pm, and there's a separate children's menu. The specifics of their child policies are clearly displayed both in the pub photo and on their website (PDF). Accessibility: Two steps to get in. Once you're in, it's step-free to the bar, at least some of the interior seating, the ladies' (unsure about gents'), and the upper part of the beer garden. There are steps to the lower part of the garden. Last visited by Kake, September 2012. Opening hours taken from the 2013 Good Beer Guide. Food times taken from board outside, September 2012. Last edited 2018-11-10 14:23:03 (version 9; diff). List all versions. Page last edited 2018-11-10 14:23:03 (version 9).